Final Approach has designed the most hands-free bag with the Waterfowler in mind. This hunting pack does it all. 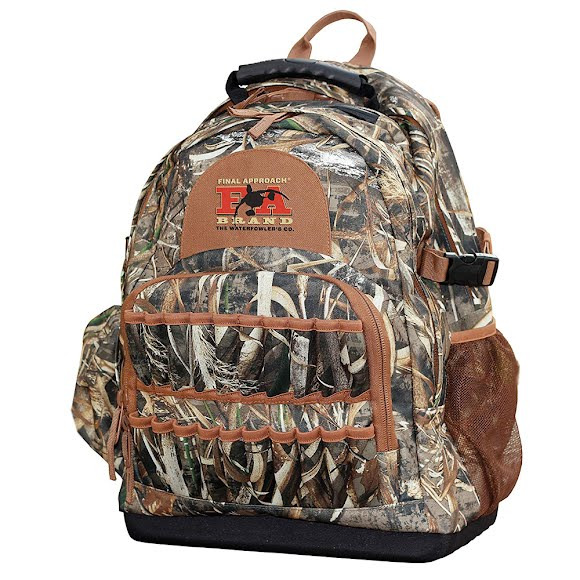 Loads of storage space for all your hunting gear, zip-out gunsling for easy carry to your spread, removable game straps for carrying your Birds from the field, a Tree hook for timber hunting, and much more! Final Approach has designed the most hands-free bag with the Waterfowler in mind. This hunting pack does it all. Loads of storage space for all your hunting gear, zip-out gunsling for easy carry to your spread, removable game straps for carrying your Birds from the field, a Tree hook for timber hunting, and much more! The hunting pack will reduce the amount of trips to and from your vehicle for quick setup. Built with waterfowlers in mind, Realtree MAX-5 is filled with cattails, reeds, cane and grasses to blend into flooded marshes. Plus corn, wheat, oats and sunflowers to hide you in open fields. It has branches, twigs and leaves that work in flooded timber. And with open areas that mimic mud, water, bark and shadows, MAX-5 literally adds another layer of invisibility to camo, no matter where or how you use it. Dimensions 18" x 13" x 5"